With the recent releases of the iPhone 8, iPhone X, and Google Pixel 2, the mobile devices that users interact with on a regular basis are only growing increasingly sophisticated. Due to this, it is becoming important to not only have a mobile-friendly website experience, but to also be able to assess the performance of your mobile landing pages. Google has reacted to this by creating a landing pages tool for the new AdWords interface. 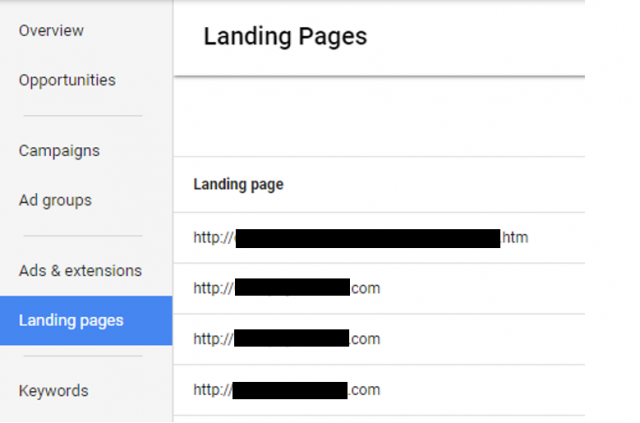 The landing pages report, which is located in left-hand menu in the interface, provides performance data for individual mobile landing page URLs. Like other performance tabs, Landing Pages allows you to customize your analysis based on the metrics you choose. You can modify columns, segment the data, create filters, show a comparative KPI chart, or download the report. Moreover, this new tool provides data on a new metric called mobile-friendly click rate. The mobile-friendly click rate column displays the percentage of mobile clicks that are brought to a mobile-friendly landing page, a status determined by Google’s Mobile-Friendly Test website. With the growing expectation that Google will soon start ranking search listings based on mobile landing pages instead of desktop, it has become a priority to ensure positive mobile experiences. Using this tool gives you direct insight into how your landing pages perform on mobile devices and identifies areas for improvement where necessary. The best way to make use of the landing pages tool is to integrate the landing page data with other device reports as well. The Mobile Overview tab within the Audience section of Google Analytics gives you a snapshot of performance across devices and serves as a valuable precursor to checking the landing pages tool. Analyzing these metrics helps you evaluate total user experience on mobile landing pages in the account. Bounce rate measures the amount of sessions during which the user leaves without any interaction, and average session duration measures the average length per session of each site user. If the bounce rate is abnormally high and the average session duration drops, that would warrant a deeper mobile landing pages check. While the Mobile-Friendly Test can be used to check website validity, other metrics can also help you diagnose problems with mobile landing pages. Just like many other AdWords tools, the landing pages report gives the option to add columns to the view. From here, adding conversion rate would show the percentage of times a site visitor converted on that specific mobile landing page after clicking an ad. A landing page with less than 100% mobile-friendly click rate and a low conversion rate is a red flag and would need immediate attention. As Google continues providing more tools that, when used in accordance with one another, help streamline the mobile experience, make sure to take advantage of the data that’s available to improve your mobile performance.